Designed to connect wirelessly to a mains-powered controller unit, Geofire's Salamander range radio-controlled fire door holders have been installed at one of London’s most prestigious apartment complexes, The Whitehouse Apartments SE1, to legally hold open fire doors and improve ventilation in the building’s corridors, while protecting occupants in case of a fire emergency. The Whitehouse Apartments SE1 is a prestigious development located on the culturally rich South Bank overlooking the River Thames, offering spectacular views of some of central London’s greatest landmarks. Originally constructed by oil company Shell as part of their UK headquarters in 1961, the 1990s saw Shell dispose of the ‘Downstream Building’ and thus The Whitehouse Apartments were born. 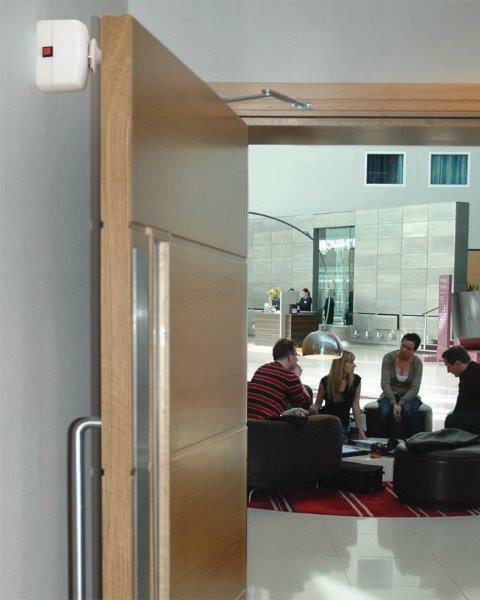 Each Salamander device connects wirelessly to a mains-powered controller unit, which is easily connected to the existing fire alarm system, complying with Category A of BS7273-4 to ensure that fire doors will safely close in the event of a fault or fire. One controller unit can manage up to 99 fire door closers or fire door holders. Geofire’s Salamander range of radio controlled fire door safety products are all battery-powered and wire-free, thus saving time, installation costs and disruption to a building’s fabric or occupants. Southbank Management, London says that the company purchased the system to improve the ventilation in the building’s corridors, "which were unbearably hot – particularly in the summer! The product adapted very well with our existing fire alarm system and was readily available. It has worked very well and resulted in us being able to reduce the temperature by 10°C in places and also improve the flow of air in the communal areas." Keeping fire doors in the open position has many benefits. It ensures ease of access in line with the disability provisions of the Equality Act 2010, helps prevent wear and tear of expensive fire doors and improves building ventilation. The Salamander swing-free door closer and door holder are suitable for use with Category A installations as defined by BS7273-4. They are approved to EN1155 and CE marked. For more information on this product please email enquiries@geofire.co.uk or visit www.geofire.co.uk .